I am not normally a fan of guides that use illustrations to show the featured species but this guide holds a special place in my heart. As a child growing up I would take this book out of the school library quite regularly until I was able to save up my money to get a copy for myself. 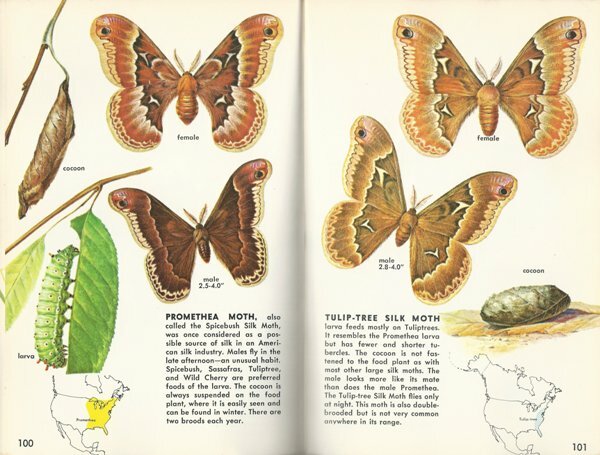 Not only do I recommend this book for the sheer nostalgia of it but I also recommend it because it is really a great little field guide on North American Lepidoptera. The currently available paperback version! 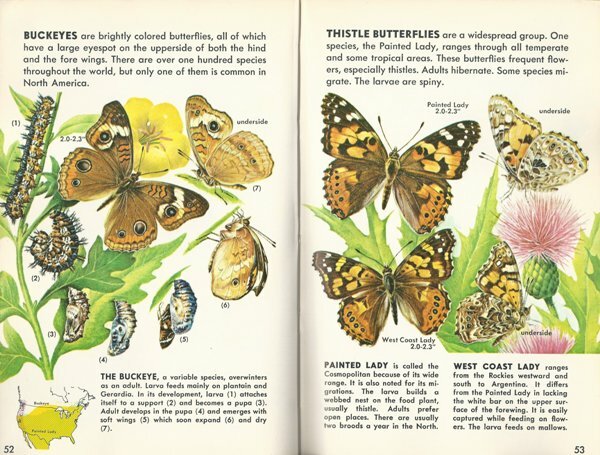 This book concentrates, in its 160 pages, on the most commonly encountered butterflies and moths. The illustrations, by artist Andre Durenceau, are breathtaking and very realistic, making identification very easy. I cannot imagine how long these illustrations took to create but they are works of art in their own right. The artwork in this amazing book is some of the best I have ever seen in a field guide! 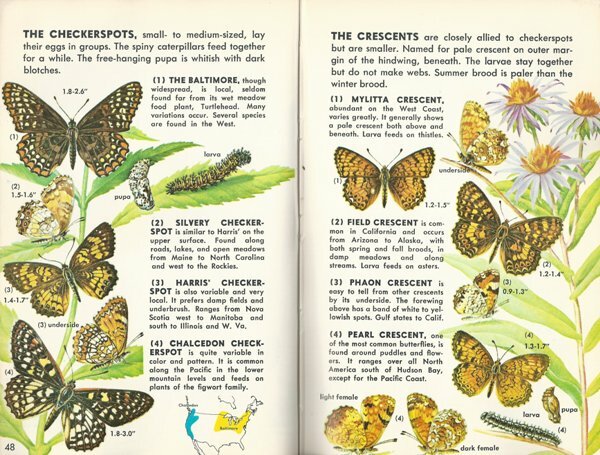 Most species feature a short description which includes the most basic of information which is why this guide is perfect for the lepidopterist in the field. In most cases larval food plants are included and range maps are very easy to use. Caterpillar images are often included and many chrysalis and cocoon pictures are included as well. These Golden Nature Guides fit perfectly in your back pocket which makes them ideal for bringing into the field with you. This one in particular is a must have for any child that shows even the slightest interest in nature, in particular butterflies and moths. Though some of the information is dated, it is still a very useful tool. The price cannot be beat either (at the time of this writing it is less than $8.00 for the paperback). 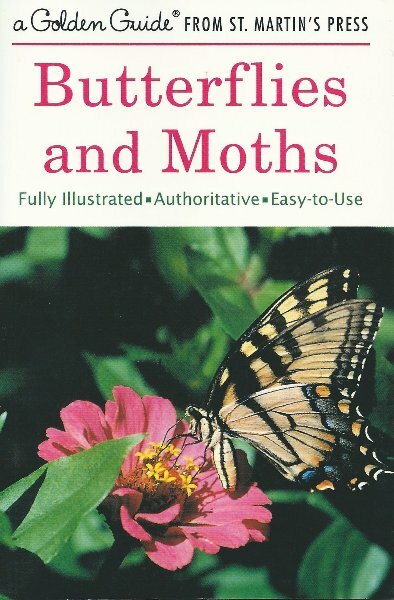 This book really helped fuel and maintain my lifelong love of butterflies and moths. I have never not had a copy of this book in my library and have had to replace it 3 times already because of the book becoming worn out. It is now also available for your Kindle which I think is great, though having a hard copy when you are out observing butterflies in the wild makes so much more sense! 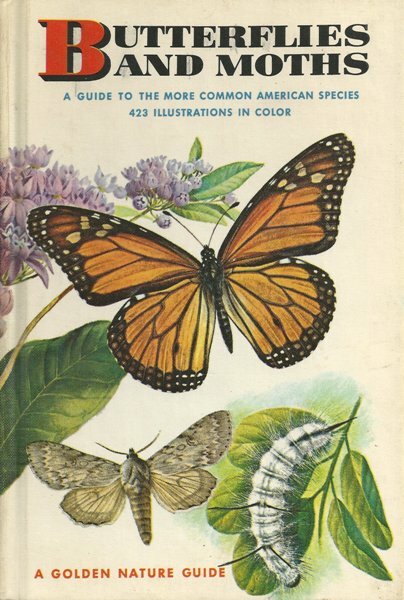 This entry was posted in Book review, Butterfly Field Guide, Butterfly Gardening, Papilionidae, Raising butterflies, Rearing moths, Saturniidae, Swallowtail Butterflies and tagged Andre Durenceau, butterflies, Butterflies and Moths, Field Guide, Herbert S. Zim, moths, Robert T. Mitchell. Bookmark the permalink.